On this cloudy and cold Monday after Thanksgiving I am cooking duck broth for soup, catching up on laundry (I know--how glamorous!) and decided to make some muffins to have with a friend who stopped in for coffee this morning. As is most of my baking--the recipe was completely experimental--even more so because I am challenged now to bake and cook only gluten and dairy free for my family. But don't be daunted by that. I know it sounds limiting-- but quite the contrary--having to re-think a recipe to make it more convincingly delicious rather than 'without' sparks my creativity in the kitchen! Optional add-ins: chopped dates, pecans, or any other dried fruit or nuts. Mix all of the dry ingredients and grated apple and raisins. Beat eggs and combine with oil. Combine the dry ingredients with the eggs and oil and add the apple juice as you stir. I used a silicon muffin mold which works great and I cooked the muffins for about 12 minutes at 375 degrees. Best eaten warm (mais bien sur!) with a drizzle of honey! 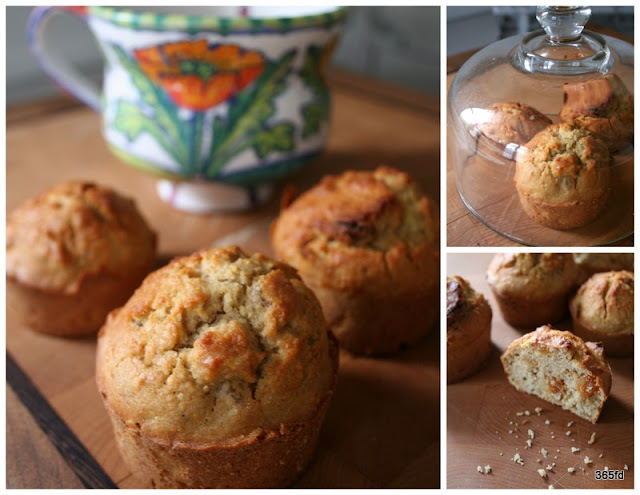 I intend to create a new muffin recipe every Monday-- it starts the week on a comforting note when at times Mondays can be challenging...so hopefully some warm apple-goodness will help push the day into a sweet direction. These look delicious! I'm right there with you on the way that life without gluten and dairy has done wonderful things for my baking skills and creativity. Sometimes constraints lead to the best sort of growth.